One of the ways in which zooites can take advantage of hashtags is by using Talk’s tag group feature. A tag group (also called a “keyword collection”) is a collection that automatically populates with all of the objects that have been given a specific hashtag by a volunteer. 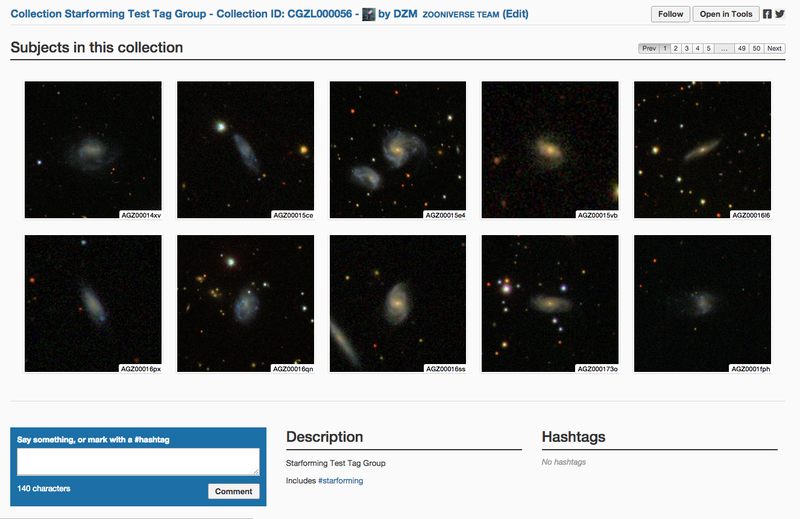 For instance, here is a Galaxy Zoo tag group that populates with all Galaxy Zoo objects that have been tagged #starforming. It will continue to automatically add new images that are given the #starforming tag as well. There are two ways to tell that this is a tag-group collection, not a manually curated one. The first is that the fourth letter in the last part of the URL (CGZL000056) is an L, for “live” collection. (The other type will have an S as the fourth letter, for “static” collection.) The second is that under “description,” the conditions for the tag group will be displayed: what tags it includes and excludes. At this point, there is no way to create a collection that includes, say, on Operation War Diary, #casualty or #sniper—only objects that have #casualty and #sniper. You can, however, exclude certain tags: e.g., all #casualty objects not also tagged #sniper, or #casualty and #sniper but no #horses. Also, please note that, like all collections, these tag groups are currently capped at 500 total visible images. It is likely that the next generation of Talk (currently being built) will feature a more refined method of curating collections from hashtags, as well as a more effective search functionality. For now, however, zooites should keep the tag group feature in mind… especially as it will be a critical feature of an upcoming project! * As of January 2015, the Zooniverse projects using the most recent generation of Talk are: Galaxy Zoo, Planet Hunters, Operation War Diary, Milky Way Project, Snapshot Serengeti, Planet Four, Galaxy Zoo Radio, Asteroid Zoo, Disk Detective, Sunspotter, Cyclone Center, Plankton Portal, Notes from Nature, Condor Watch, Floating Forests, Penguin Watch, Worm Watch Lab, Higgs Hunters, and Chicago Wildlife Watch.